The escalating tensions between the US and China can no longer be accurately described as a mere trade war, in our view. Instead, recent developments suggest that the countries are teetering on the edge of a new Cold War. In fact, we think the situation has deteriorated over the past few months. Vice President Mike Pence's recent major policy speech on China at the Hudson Institute outlined several serious concerns regarding China in unusually blunt language, such as Chinese interference with US elections, cyberattacks, unfair government subsidies, and theft of American technology. The language is, in our view, calculated to shock Chinese government officials who are used to hiding more stern pronouncements behind soft language. The scope of Pence's speech went far beyond mere trade issues. In particular, China's industrial policy, Made in China 2025, targeting progress in high-tech industries like robotics and artificial intelligence, shifts the battlegrounds to not only across trade, but investments and technology, he said. The US alleges that China is pursuing its industrial policy by illegitimate means, including theft of intellectual property. Meanwhile, China may see the US' concerns less as a desire to uphold international norms and more as an intention to prevent China's rise to economic and geopolitical parity with the US by any means necessary. Furthermore, Pence mingled critique of China's domestic affairs in with the long-standing critique of its international policies by citing Taiwan as a political model and disparaging China's "lip service to reform and opening." With the increase in trade barriers threatening to sever economic ties between the countries, a new Cold War scenario seems more likely than ever. That said, some believe relations could be thawed with a new administration in 2020, a slowdown in US economic growth, or even that Pence's speech was designed to target US voters ahead of a high-profile midterm election in November. Both sides still seem far apart. China has been reluctant to present a list of concessions to the US unless it can deal with a US government official who can negotiate on behalf of the administration, and earlier talks have been derailed by President Donald Trump overriding a proposed agreement in May. Moreover, the confusion over who is negotiating for the US is feeding China's views that Trump may be shifting the goal posts on his trade policy. Altogether, it appears to us that China is calculating that it is better to weather the near-term economic impact rather than give in at this point. In particular, China is unlikely to accede on its Made in China 2025 strategy, especially if it views US complaints as unfair. From the Chinese perspective, this is a necessary policy for its long-term development. China needs to find ways to escape the middle-income trap, and the standard recipe for this is to move the economy into higher value-added industries, which is what this policy aims to do. Paradoxically, the US' newfound focus on Made in China 2025 makes it less likely that China will reach a settlement with the US on overall trade issues. If anything, China will pursue Made in China 2025 more aggressively to offset economic any headwinds created by reduced exports to the US Till now, China has instituted policy changes at a snail's pace to avoid disruption. This is why we thought China would be willing to make some concessions, to avoid volatility, particularly from already-high domestic debt risks. But with China feeling boxed into a corner, leadership may be gearing up for a long march to resist US pressures, including the possibility of using even more debt to cushion the short-term economic blow from tariffs if needed. Most analysts have estimated a muted economic impact for both countries from the tariffs. For example, the IMF lowered its GDP growth forecasts for both countries by 0.2% in 2019 due to trade war impact in its latest World Economic Outlook. It's key to note that any significant impact from tariffs has yet to play out in economic data released so far. 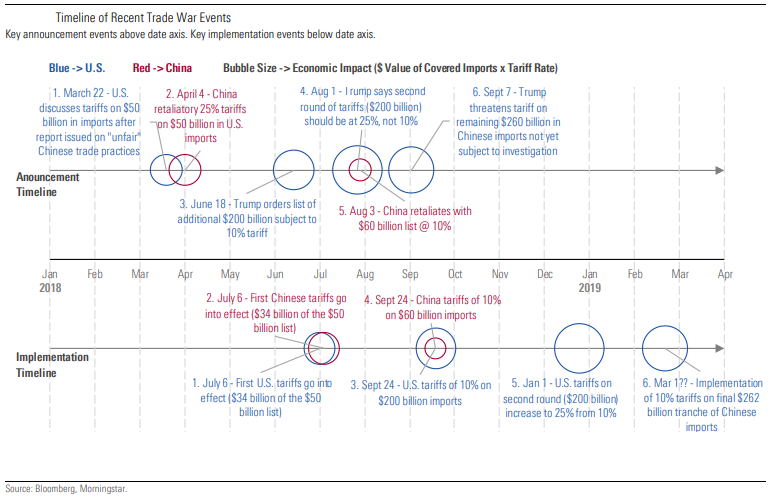 Only the first major round of tariffs; 25% on $50 billion worth of US imports from China at 2017 levels, had an effect in the third quarter. The second round was implemented on Sept. 24, with 10% US tariffs on another $200 billion in imports. Tariffs ramp up aggressively in the next several months. The second-round tariff rate will escalate to 25% from 10% on January 1. Meanwhile, we think tariffs on the remaining $260 billion in Chinese imports could be implemented in the first quarter, especially if China retaliates against the January 1 US tariffs, although it has not yet announced an intention to do so. Altogether, this means that the average incremental US tariff across all Chinese imports could reach 17% by the second quarter of 2019. Assuming that US consumers and Chinese producers bear the tariff costs equally, this would equate to about a $40 billion hit, or about 0.2% of China's GDP. The full impact could be much greater, however, because of the likely knock-on effects from workers and businesses in affected industries. Still, we emphasise that the most impactful issues for the Chinese economy are essentially unchanged from the last several years, trade concerns notwithstanding. China's high debt and how it handles credit growth and deleveraging, reform, and future investment will have more of an impact than higher tariffs on the Chinese economy over the long run. Preston Caldwell is equity analyst at Morningstar.